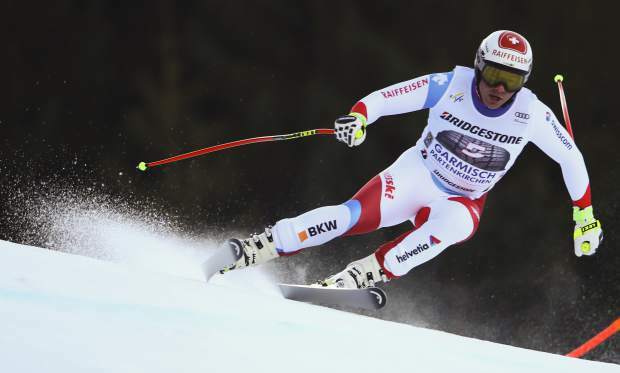 GARMISCH-PARTENKIRCHEN, Germany — Beat Feuz won the last men’s World Cup downhill race before the Olympics to underline his status as a gold-medal favorite on Saturday. “I go as the downhill World Cup leader to the Olympic Games. It couldn’t be nicer,” Feuz said two weeks before the Pyeongchang Games commence. “The World Cup will be decided in Are [Sweden] and not in Garmisch. But it’s nice to be able to discuss such performances and finishes at the moment,” the 30-year-old Feuz said, looking ahead to the last competition of the season in March. Home favorite Thomas Dressen, who ended Germany’s 13-year wait for a men’s downhill win in Kitzbuehel, finished 0.53 behind in seventh, while another German, Andreas Sander, was on course to beat Feuz but lost time after the final jump and finished 11th.